Facebook users will see "I voted" button again this year. Evernote updates Work Chat app. These stories, and more, in today's Morning Social Media Newsfeed. 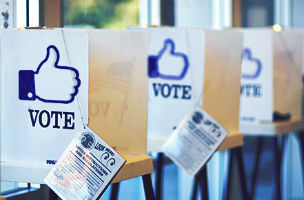 On Tuesday, Facebook will again deploy its voting tool. But Facebook’s Michael Buckley, vice president for global business communications, insists that the firm will not this time be conducting any research experiments with the voter megaphone. That day, he says, almost every Facebook user in the United States over the age of 18 will see the “I Voted” button. The HillIn the past, some were left out to be used as a control group. The Wall Street Journal Earlier this month, Facebook requested removal of a YouTube video of one of the scientists discussing the work because too much publicity might prevent the research from being published in some academic journals, the spokesman said. The spokesman said researchers plan to publish the study in an academic paper next year. Evernote has begun rolling out updates to its note-taking app to enable a conversation tool: Work Chat. The feature was first introduced at a conference in October and basically does what you’d guess – it lets you chat about the documents you’re working on. Happy Halloween! While Americans were busy spending over $2 billion on candy to stock up for trick-or-treaters, Engagor has been looking at which treats were most popular on social media. The verdict: M&Ms. New York-based AOL is combining its ad platforms — Adap.TV and AdLearn Open Platform (AOP) — into one system, which is aptly named One. Launching in February, One will combine programmatic buying of video from Adap.TV and display and banners from AOP, and it will include the cross-device capabilities. Friday is question-and-answer day at Facebook’s headquarters in Menlo Park, Calif., as co-founder and CEO Mark Zuckerberg hosts a weekly Q&A where employees can ask him questions on any topic. Zuckerberg announced in a Facebook post that since all of the social network’s users can’t come to Menlo Park, he is bringing Menlo Park to the users by hosting a community Q&A on Facebook. Now there’s a Lifetime Christmas movie! With Aubrey Plaza voicing Grumpy Cat (which isn’t altogether inappropriate, but still). So, we just have to ask: Really, Lifetime? Dance Moms wasn’t enough? Twitter’s real-time nature can certainly inspire stage-fright, especially when you’re faced with coming up with five, 10 or more tweets per day. Here are 50 ideas for what to tweet when you’re stuck. The key for parents, says Michele Lee Kozimor-King, an associate professor of sociology at Elizabethtown College, is to understand both the benefits and downside of social media when it comes to their children. Here are her five tips for helping children navigate through a virtual world.